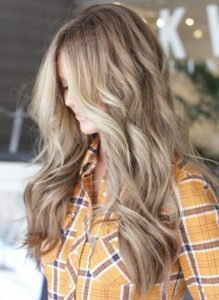 Sandy blonde is a great way to wear your lighter locks in a style that looks natural and has lots of depth. 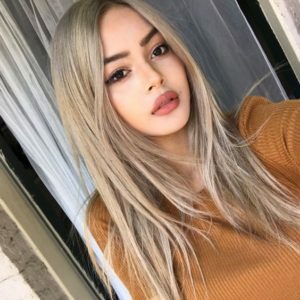 If you were born a blonde but your hair has progressively darkened over time sandy blonde can get you back to your lighter roots without looking like a completely different person. Brunettes who have always wanted to go lighter will appreciate the subtle aspects of sandy blonde hair. 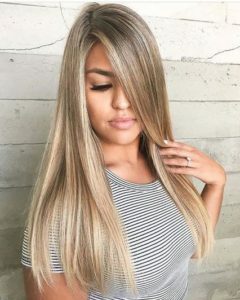 These blondes can be mixed with warm or cool blonde highlights to suit a variety of skin tones, and is one of our favorite color palettes for creating gorgeous balayage looks. Our favorite sandy blonde hair looks show just how many ways there are to wear this summery shade. 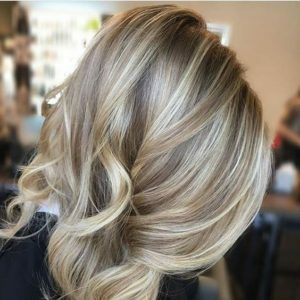 The perfect blend between natural and intense, this light sandy blonde features all over highlights that begin right at the roots. Highlights are concentrated around the face to help give a brightening boost, and will work especially well with cool complexions. Make the most of your sandy blonde style with contoured highlights that are strategically placed in the strands around your face. 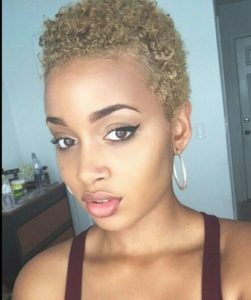 This ultra trendy look is popular in all hair colors, but leans more towards a natural look when done in a sandy blonde shade. Although long hairstyles offer up tons of canvas for creating sandy blonde balayage landscapes, this chin-length bob makes great use of dimensional sandy colors. 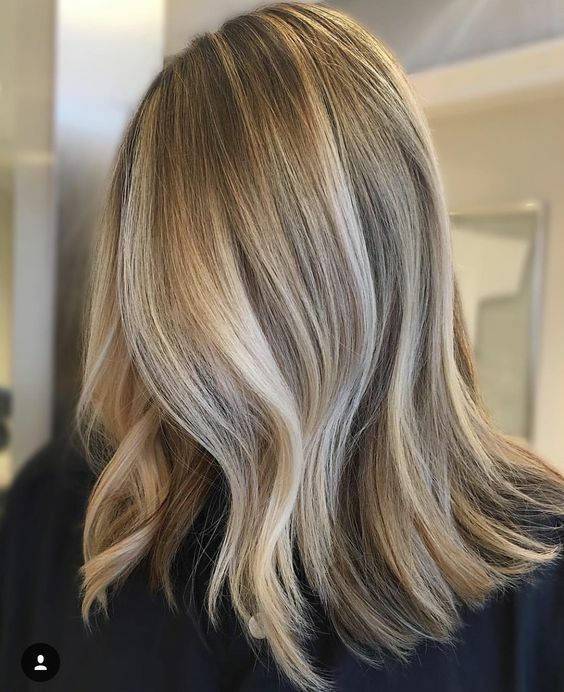 Whether you go dark blonde at the salon or its your natural base color, ashy highlights can help brighten up your style while still keeping your hair looking simple and natural. 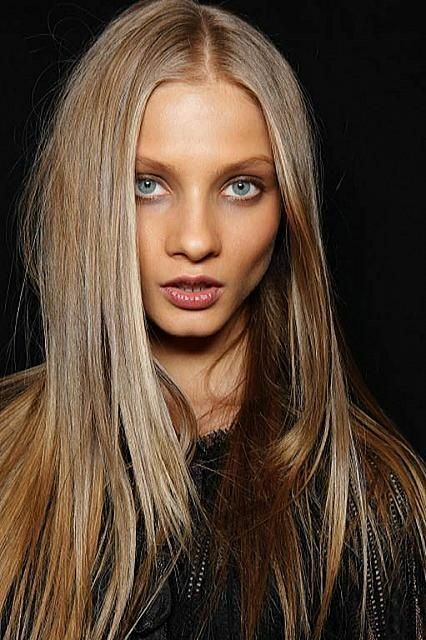 If you aren’t after a look with bold and obvious highlights, try an all-over color like this pale sandy blonde. 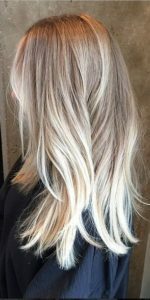 Darker roots help to bring some depth to this style, and make touch-ups less of a necessity for ladies who are naturally dark blonde. Elizabeth Olsen’s neutral shade of sandy blonde is a perfect complimemt to her fair skin and green eyes. 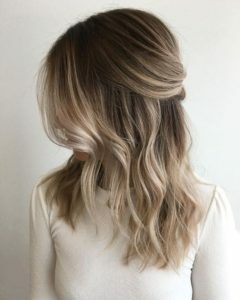 With balayage highlights that are just a shade or two lighter than her base color, this sandy blonde hairstyle is the definition of chic, understated style. 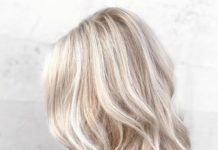 Medium sandy blonde is great for women with medium or tan complexions, especially for those who worry they can’t wear an ashy or ultra light shade of blonde like platinum. 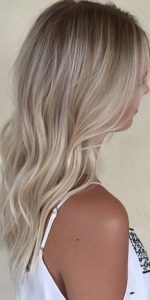 This gorgeous sandy blonde hairstyle gets just the right amount of oomph from contouring highlights that have been placed in the middle of hair’s lengths around the face. 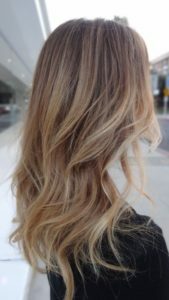 This look is a little more subtle than some contourage styles, but still delivers the impact of multidimensional highlights. Keep it simple with a single shade of sandy blonde that looks natural and sophisticated. 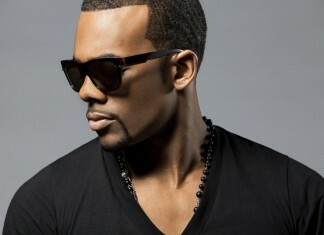 If you have super straight hair that’s hard to curl, an all-over color can do a nice job of subtly enhancing your style. 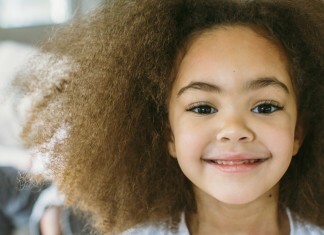 Natural curls in a sandy blonde color can help to brighten up dark tan skin tones. 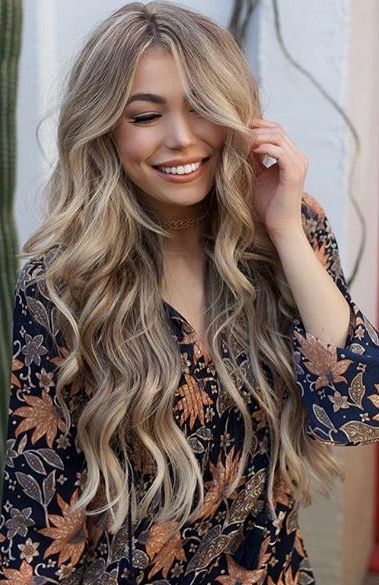 Choose warm or cool notes in your blonde hair to match your complexion, and your style will retain a natural feel even if it’s much lighter than the hair you were born with. This pale sandy blonde is perfect for pumping up the appearance of thin hair, while dark roots help to make the style look natural and dynamic. Golden highlights help to elevate this sandy blonde hair from a simple single-tone style, and make a great choice for women who have golden or yellow tones in their skin. 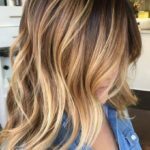 If you’re after a sandy blonde look heading into summer, this golden blonde style will have you feeling ready for the beach. Thin ribbons of ultra subtle babylights help this sandy blonde hairstyle look soft and fun. 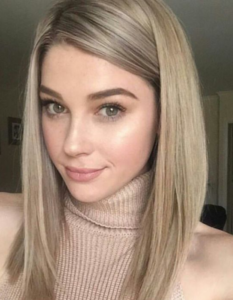 The overall neutral look of this blonde style makes it ideal for fair-skinned women who want to make blue or green eyes pop. Fair and medium skin with cool undertones looks incredible against this light shade of ashy sandy blonde. 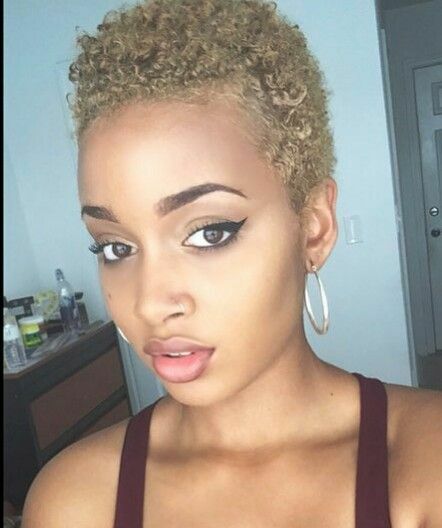 Choosing a blonde that’s quite close to your skin tone can help curate a high-fashion look that puts your facial features on display. The stretched roots in this look help to create some contrast against the light shade of sandy blonde that covers most of the hair. 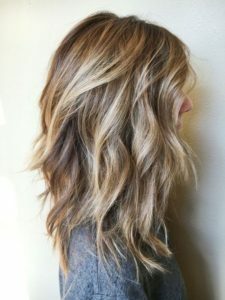 If you’re not just looking for any sandy blonde hairstyle, but the one that will make friends and strangers fawn all over your fresh color, this dimensional balayage is a must-have. 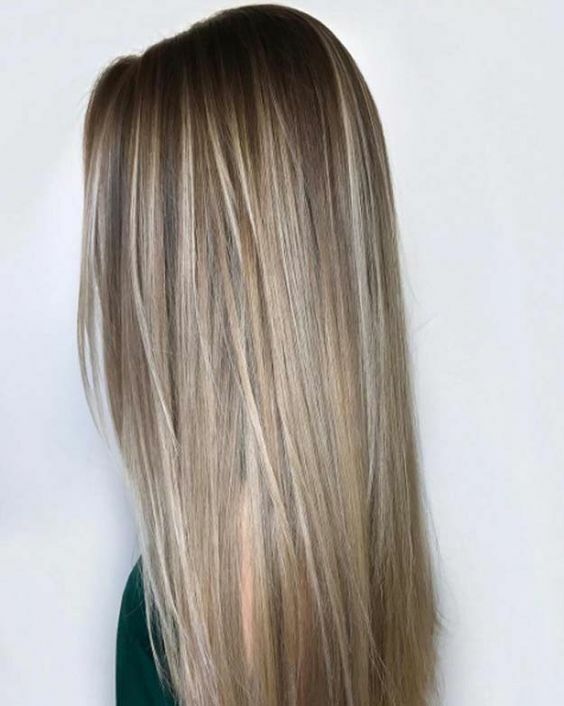 Highlights strike the perfect balance between showy and natural, enhancing your haircut and helping your strands to look thicker and more full. 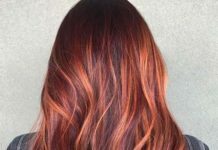 These all-over highlights are an excellent choice for creating the illusion of more volume in hair that’s particularly thin. 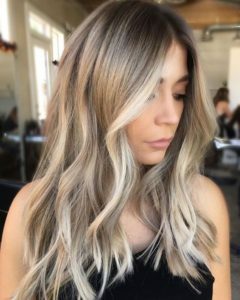 Unlike a balayage or ombre style, be prepared for more salon visits to keep this sandy blonde style from looking grown out. Hair that’s this long and thick deserves hair color that looks rich no matter the shade you choose. With sandy golden notes and some subtle ombre sections, this luxurious style will do your long mane justice. 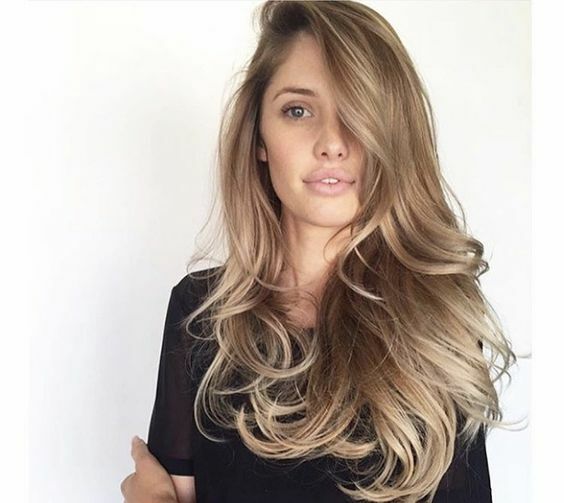 Layered sandy blonde color gives these brushed out spiral curls an avant garde edge that looks like it was ripped straight from a fashion runway. With darker sandy roots and a more pale champagne blonde at the ends, this color melt style is the perfect way to get dimensional blonde that’s blended seamlessly from roots to ends. Dark sandy blonde color at the roots and in hair’s underneath layers help to create a natural looking frame for lighter blonde highlights around the face. 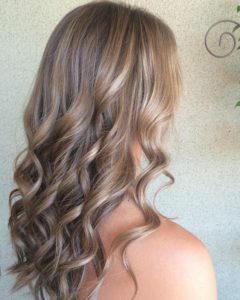 This sandy blonde base color has warm red undertones that make it perfect for ladies with warm tan skin. 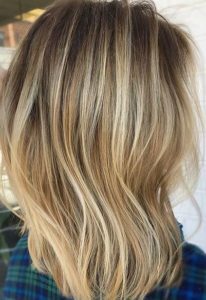 A lighter blonde ombre is applied at just the right length to enhance this shoulder-grazing lob without taking over the textured blunt cut. For the ultimate in natural highlighting, a flamboyage technique applies accent colors throughout your hair rather than selecting specific strands or lengths to highlight. 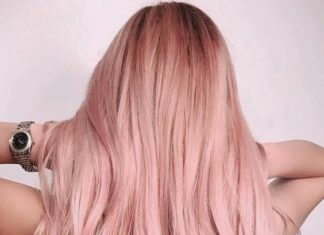 The end result may have people fooled that your perfect sandy blonde color is all natural. This pale sandy blonde base color and buttery blonde highlights are a great example of how different tones of blonde can work together in one hairstyle. 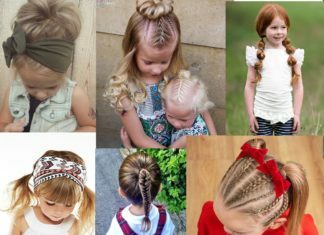 Women with pale or relatively neutral skin tones will have the best luck pulling off this style. The trendy in between shade looks luminous and sophisticated with sandy tones. 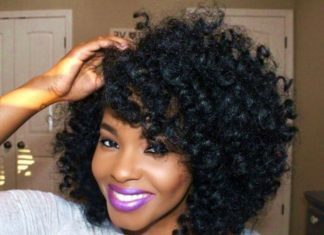 Women with medium or deep complexions will appreciate this darker sandy look’s ability to enhance their features without looking too light. 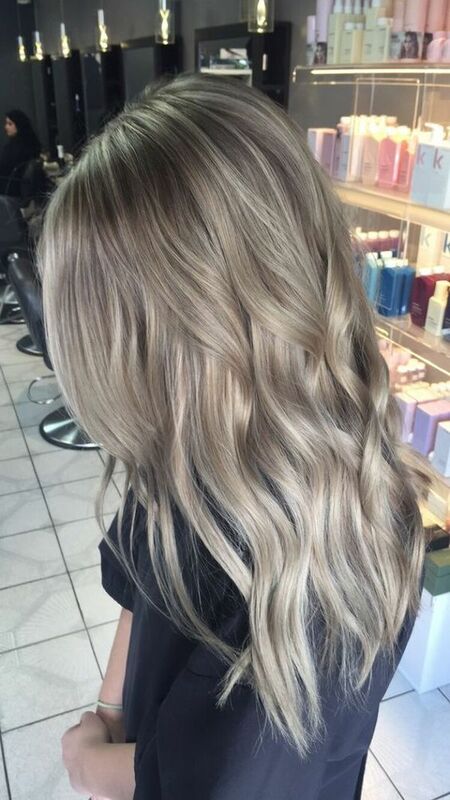 Use this style to breathe new life into your dark blonde hair. A sandy base color and platinum ends make this multidimensional style a winner for women with cool complexions. Dark sandy blonde roots get an in-your-face boost thanks to high contrast blonde ombre highlights. 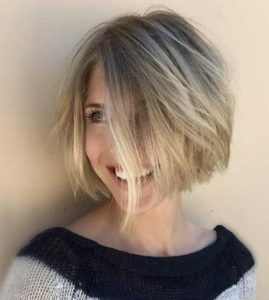 This is a great transitional style for between seasons or if you’re progressively lightening hair that’s dark blonde or naturally brown hair. Sandy blonde roots and dimensional golden blonde strands create a summer-ready color that’s perfect for highlighting green eyes or skin that freckles in the sun. Leave it to model Lily Aldridge to flawlessly execute a dark brunette base color with sandy blonde ombre highlights. 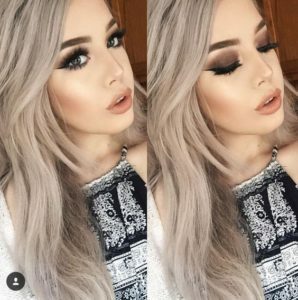 The contrast between these two shades looks sophisticated instead of brash thanks to some face framing highlights and a professional blending technique. Make your fair skin look more tan and luminous with a cool sandy blonde color from roots to ends. 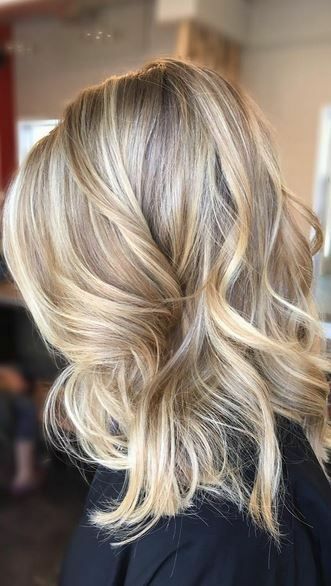 Sandy blonde highlights and light blonde roots give these thick curls just the right amount of color to enhance their texture without completely taking over the look. These buttery blonde highlights are in an extra pale shade that can be hard to pull off from roots to ends, making sandy blonde roots the perfect choice to anchor this style and create depth. 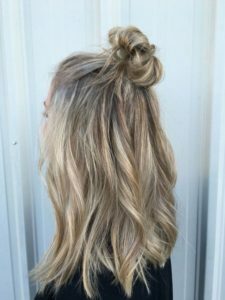 If you’re a natural dark sandy blonde, golden highlights around the face can give you a color refresh just in time for spring or summer. 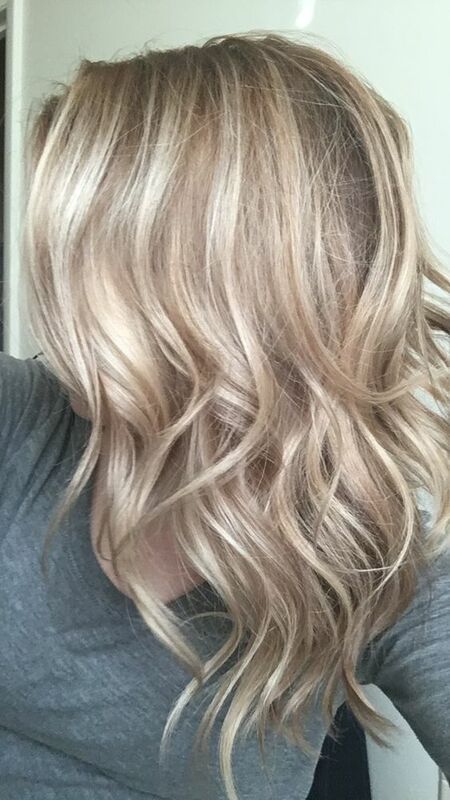 Single tone hair color is anything but boring in the perfect shade of sandy blonde. If you’re into crimson lips like Taylor, this color is the perfect neutral to frame and enhance your face. 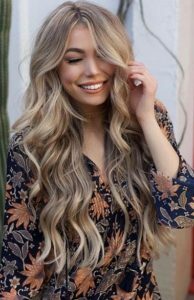 This sandy blonde hair has the soft look of a true natural style, and first perfectly with earthy tones in your complexion.